Grandma's Fruit Tart Recipes : Easy to Make and Oh So Good! You'll love Grandma's old fashioned fruit tart recipes. 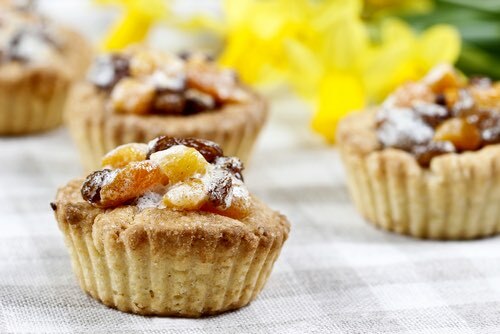 Back in Medieval times, tarts were made quite large, but there was a smaller variety called tartlets. 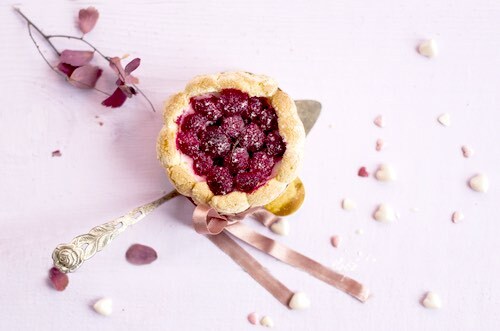 It's only in recent generations that tarts have consistently been made small. 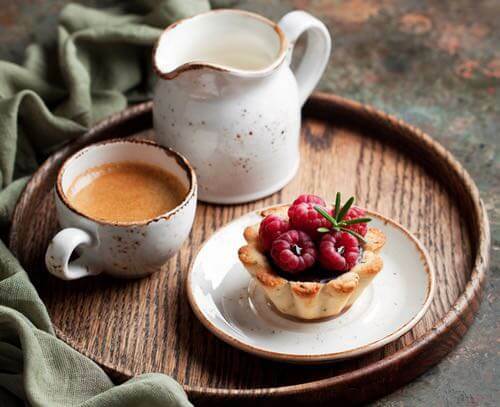 Traditionally, the main difference between them and pie is that tarts are usually made without an upper crust. This allowed early cooks to make their pastry desserts colorful and enticing by using bright fruits and berries to great decorative advantage. These old fashioned tarts are not only enticing with their colorful fruit fillings, but they taste delectably delicious too. Take a peek at Grandma's pie crust recipes if you would prefer to make you own pastry. Roll tart pastry thin and cut in rounds to fit your muffin tins. Bake in moderate oven (325°F) until lightly browned. Place marshmallows and crushed banana in double boiler until dissolved, let cool slightly, fold in cherries. 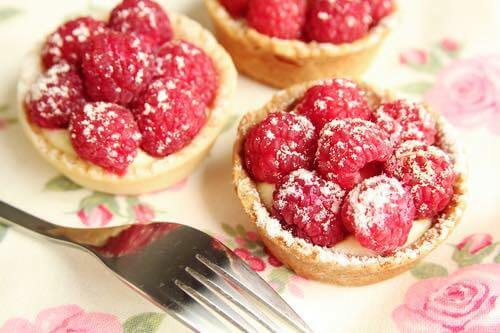 Fill tart shells with filling and decorate as desired. Lemon Butter Filling: 2 eggs, well beaten; 1 cup sugar, 1/4 cup butter, 2 tablespoons grated lemon rind, 1/4 cup lemon juice. Combine eggs and sugar in top of double boiler. Add butter, lemon rind, and juice. Cook over gently boiling water, stirring constantly until mixture thickens. Cool. Rolled Oats Butter Pastry: 1-1/2 cups sifted pastry flour, 1 teaspoon salt, 2/3 cup butter, 1/2 cup rolled oats, 4 to 6 tablespoons cold water. Sift together flour and salt. Cut in butter until mixture resembles coarse crumbs. Add rolled oats; mix lightly. Add water, a little at a time, stirring lightly until pastry can be formed into a ball. Roll out thinly on floured surface; cut into 3-inch rounds. Fit into small pans; prick bottom and sides of shells with fork. Bake in a hot oven, 425°F, 10 to 12 minutes. Cool; fill with Lemon Butter Filling; top with bits of cherry. Makes about 3 dozen small ones. For this vintage fruit tart recipe, sift dry ingredients. Cut in shortening. Add as little water as possible to make dough. Roll 1/8 inch thick on lightly floured board. Line shallow muffin rings. Brush with melted shortening. Fill with cherry filling (below). Cut remaining pastry into narrow strips and lay crisscross over filling, moistening ends and pressing into pastry rim to secure. Bake in hot oven (425°F) about 20 minutes. Makes 8 tartlets. Cherry Filling: Stem and stone 1 quart red cherries. Mix 1 cup sugar and 2 tablespoons flour, combine with cherries. Canned Cherry Filling: (If fresh cherries are not available.) Drain canned cherries to get 1-3/4 to 2 cups of fruit. Mix 1/2 cup sugar and 1 tablespoon flour. Mix with cherries. Add 1 teaspoon lemon juice. Fills about 8 tartlets. Technically a coconut isn't a fruit, but its meat is moist and delicious, perfect for a fruit tart recipe. 1 quart milk, 1 cup sugar, yolks of 3 eggs, 2 tablespoons cornstarch, 1/4 pound coconut. Heat milk in double boiler, add other ingredients and stir in the coconut. While hot, fill tart shells with this mixture. Beat to a stiff froth the whites of the 3 eggs, in which beat 1/2 cup coconut and 1/2 cup sugar. Spread meringue on tarts and tinge a delicate brown. Line small pie tins with pie crust and bake. Just before ready to use, fill the shells with strawberries, blackberries, raspberries, or whatever berries are in season. Sprinkle over each one a little sugar; after adding berries add also to each tart a tablespoonful of sweet cream. They form a delicious addition to the breakfast [or luncheon] table. Take the juice of two large oranges and the grated peel of one, three-fourths of a cup of sugar, a tablespoonful of butter; stir in a good teaspoonful of cornstarch into the juice of half a lemon and add to the mixture. Beat all well together and bake in tart shells without cover. Mix well together the juice and grated rind of two lemons, two cupfuls of sugar, two eggs and the crumbs of sponge cake; beat it all together until smooth; put into twelve patty pans lined with puff paste and bake until the crust is done. For this fruit tart recipe, pare, quarter, core, and boil in half a cupful of water, until quite soft, ten large, cooking apples; beat until very smooth and add the yolks of six eggs, or three whole ones, the juice and grated outside rind of two lemons, half a cup of butter, one and a half of sugar (or more, if not sufficiently sweet); beat all thoroughly, line patty pans with a puff paste and fill; bake five minutes in a hot oven. Meringue: If desired very nice, cover them when removed from the oven with the meringue made of the whites of three eggs remaining, mixed with three tablespoonfuls of sugar; return to the oven and delicately brown. Ingredients: Trimmings of puff paste, any kind of jam. Method: Butter a tart-pan of the usual shape, roll out the puff paste to the thickness of 1/8 of an inch, and line the pan with it, prick a few holes in the bottom with a fork to prevent the paste rising and blistering, and bake the tart shell in a brisk oven from 10 to 15 minutes. Let the paste cool a little; then fill it with preserve, place on it a few decorative stars or leaves, which have been previously cut out of paste and baked, and the tart is ready for table. By making the tart in this manner, both the flavor and color of the jam are preserved, which would be spoiled were it baked in the oven on the paste, and less jam is required.